Beets eluded me as a child. I found them to be too sweet and too earthy tasting, especially for a vegetable. In my mind vegetables had to taste like vegetables. Green or bitter or sour but definitely not sweet. They say that the taste buds of a child are not developed and simple and that certain things require maturity or an acquired taste. I guess I would have to agree. The older I got the more intrigued I became about certain foods and anything that made me feel more grown up I was attracted. I didn’t last long before I took pleasure in a sip of coffee or bitter chocolate and so on. Now I observe the same development with my kids and I see how they navigate the fine line between liking and disliking certain things and eventually proclaiming with pride that they love certain foods. More as a way of impressing company and appearing sophisticated. Not so long ago my daughter had to bring in something to school that had rice as a main ingredient and she got so excited about it that she spent days deciding what she should bring. Eventually she decided on bringing mochi, a Japanese speciality that she first had at our neighbors. The idea of knowing about exotic ingredients thrills her and makes her feel special. I stumbled across a recipe with the title beets and berries in one of my favorite cookbooks about vegetables called On Vegetables by Jeremy Fox and was curious about how those two ingredients could work together. 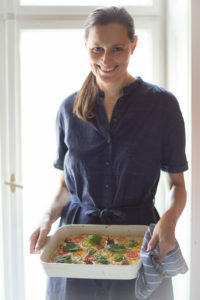 Originally I was looking for a recipe to do for a cooking class with the focus being on seasonal vegetable cooking. It was a great success with the class so I decided I had to share it here. Among the great joys of blogging and being active on social media is the connections that I have made with like minded creatives. One such person is Peppa Georgieff. She is a Vienna-based photographer who is focused on empowering and inspiring women & female entrepreneurs to create a purposeful business and live lives that they love. We connected on Instagram and after a few meetings we decided to do a collaboration and the result you will see here and in the near future on my social media accounts. I have never done a branding session but it has been something that I have thought about a lot. There are so many ways I can present myself and I haven’t approached it in such a thorough way. Through my work with her I’ve been able to define more what I would like to share with my audience and how I want to use my voice. We had a wonderful session together and the photos you see today are a small selection of images that were produced. It was an inspiring experience for me and I realized how important it is to surround myself with people who are on a similar journey as me and who understand the things that I’m going through and can relate on a personal level with the struggles and also the joys of running a creative business. On that note, let’s move on to the recipe. I like to roast beets once a week and then I use them in different contexts throughout the week. Besides a classic beet salad I like t make beet hummus, add them to buddha bowls or to soups and stews as a sweet addition. Once the beets are roasted it is a simple affair. 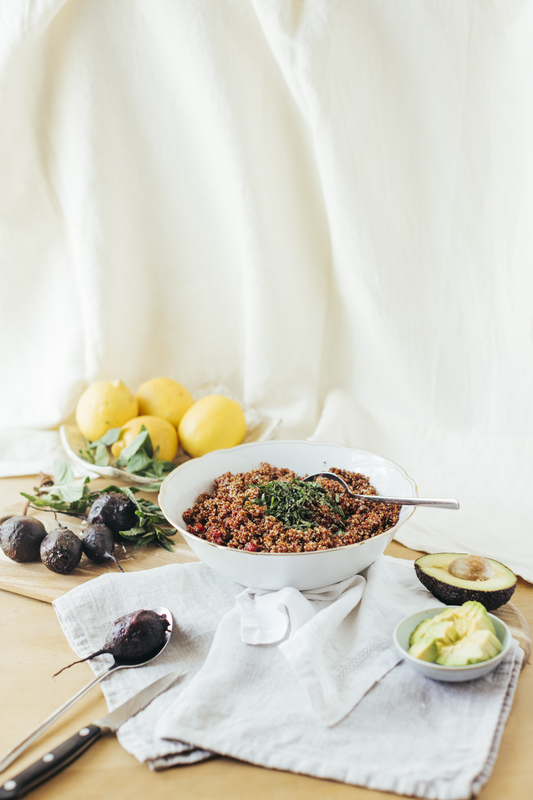 Quinoa cooks in 15 minutes and the other ingredients are thrown together very easily. One addition that is not here but that I highly recommend is a scattering of pistachios at the end. The taste and colour compliment the whole dish beautifully, so I will add that to the notes in the recipe. Preheat the oven to 190 °C. Wash the beets under cool water and pat dry. Lightly coat them with olive oil and a good pinch of salt. 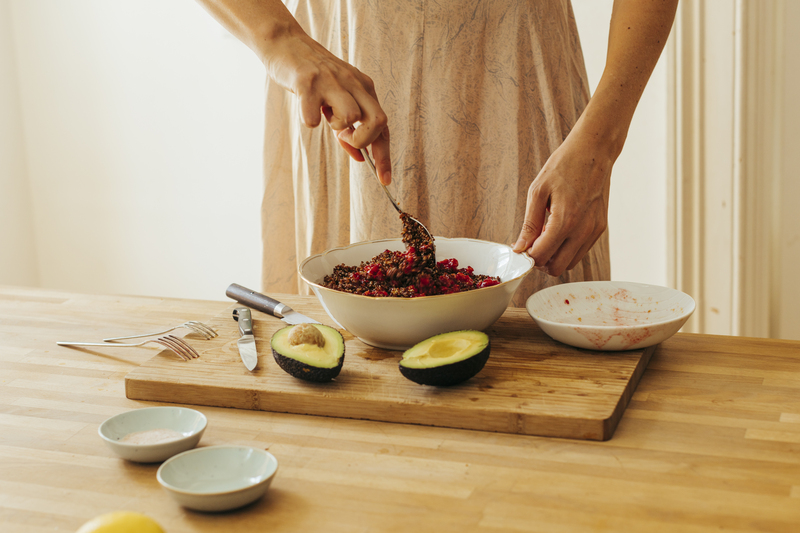 Place the beets in a baking dish with just enough water to cover the bottom of the dish and bake until there is no resistance when the beets are pierced with a cake tester, 45 minutes to one hour. Once the beets are finished cooking, remove them from the oven and let them cool down until you can handle them. Using gloves or not, peel off the outer skin. You now have roasted beets. Cut the peeled beets into whatever size or shape you like and toss them with the olive oil, red wine vinegar and salt to taste. Set the beets aside until plating. 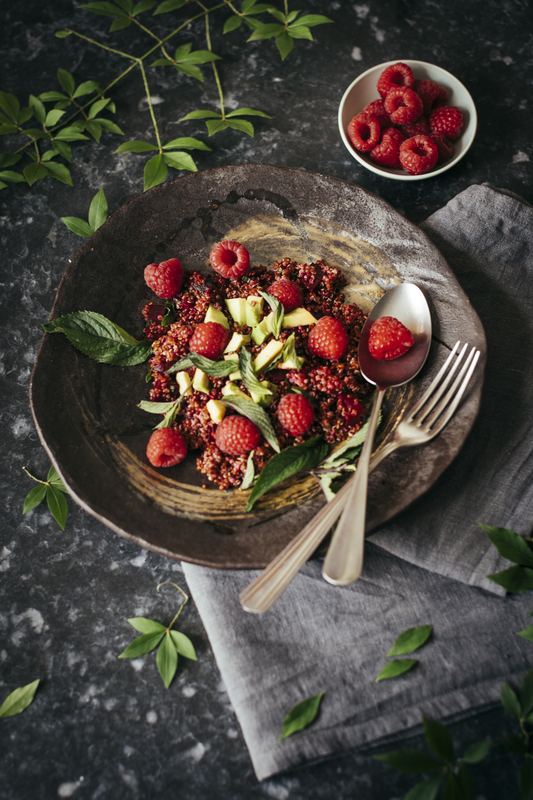 Rinse the red quinoa under cold running water. 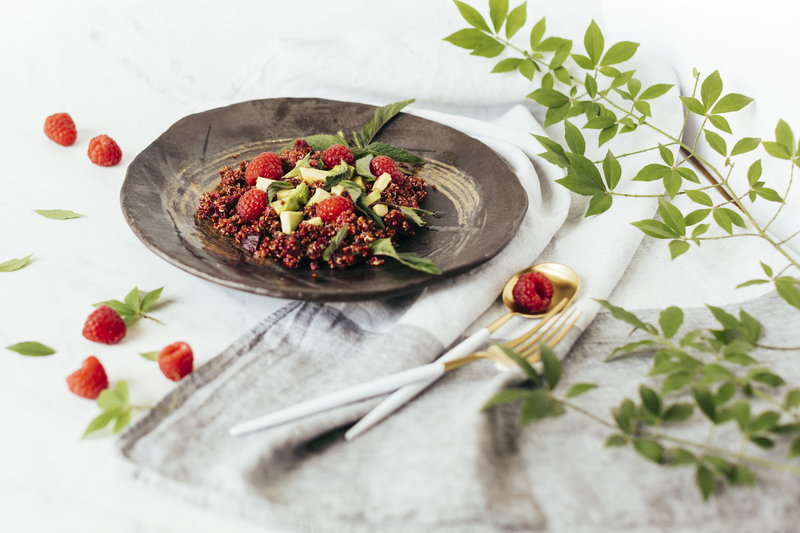 IN a pot, combine the quinoa and 320 ml cool water. Bring to a boil over medium heat. Cover, reduce the heat to a simmer, and cook unti all the water is absorbed, 15 to 20 minutes. 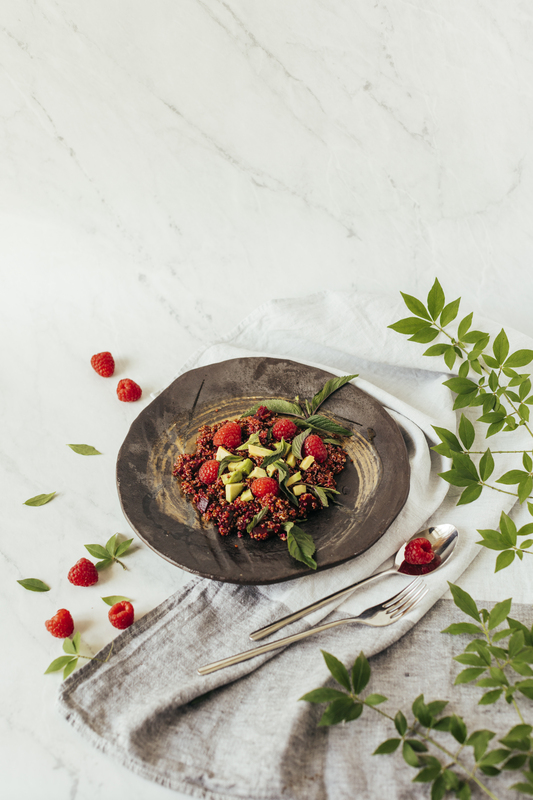 Remove from the heat, fluff the quinoa with a fork, and toss it with the olive oil, the mint, lemon zest and juice, and salt to taste. 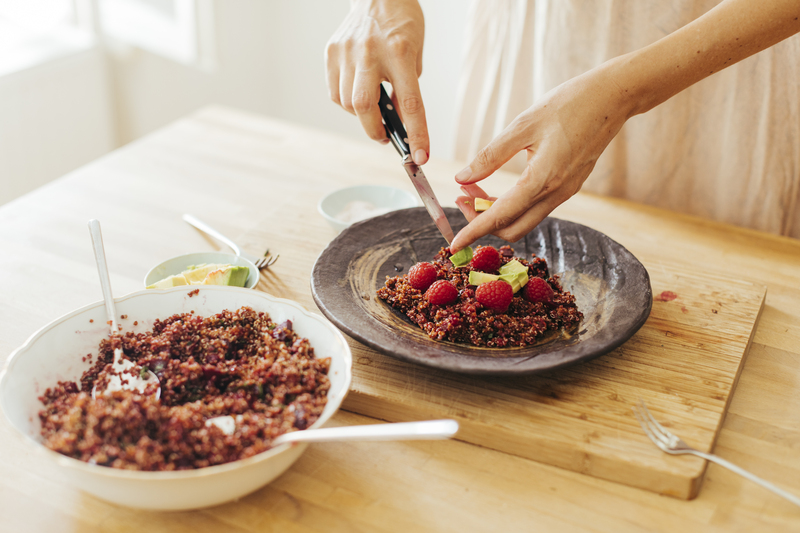 Cool the quinoa before serving. 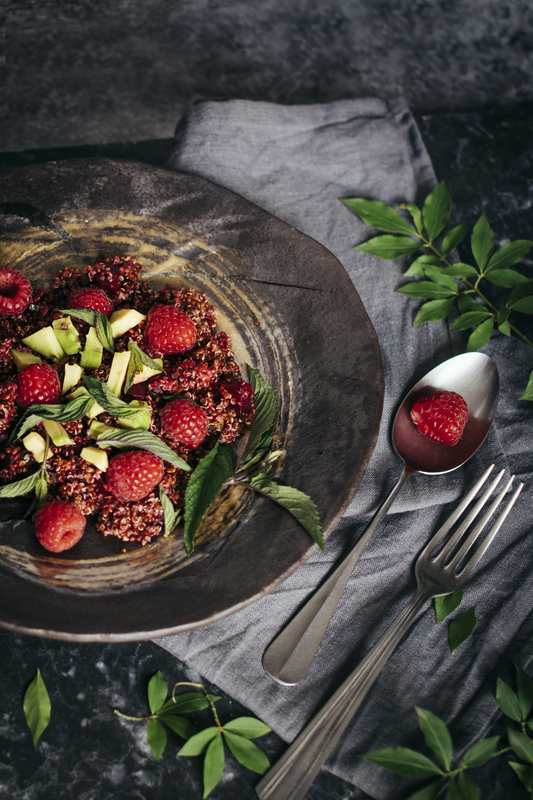 In a bowl, toss the berries with the remaining olive oil, season lightly with salt and mash them with a fork until the oil and the juices combine. 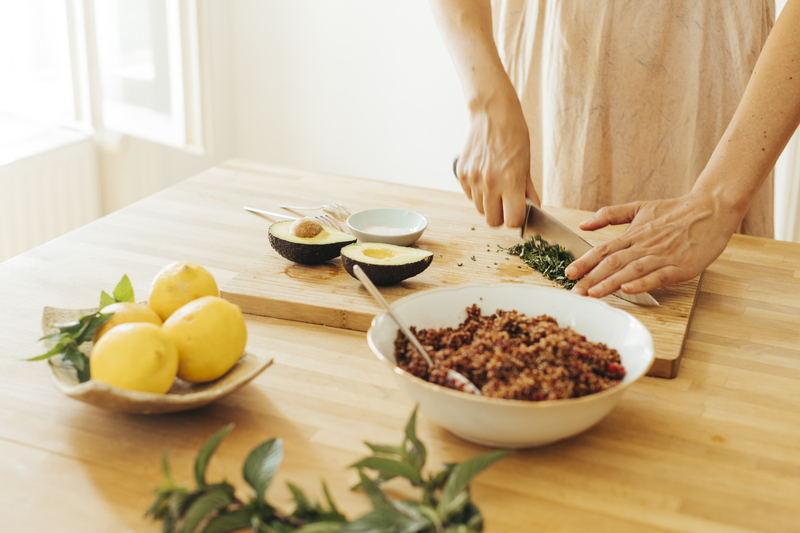 Right before serving, pit the avocado, cut into small cubes and season lightly with salt and olive oil. 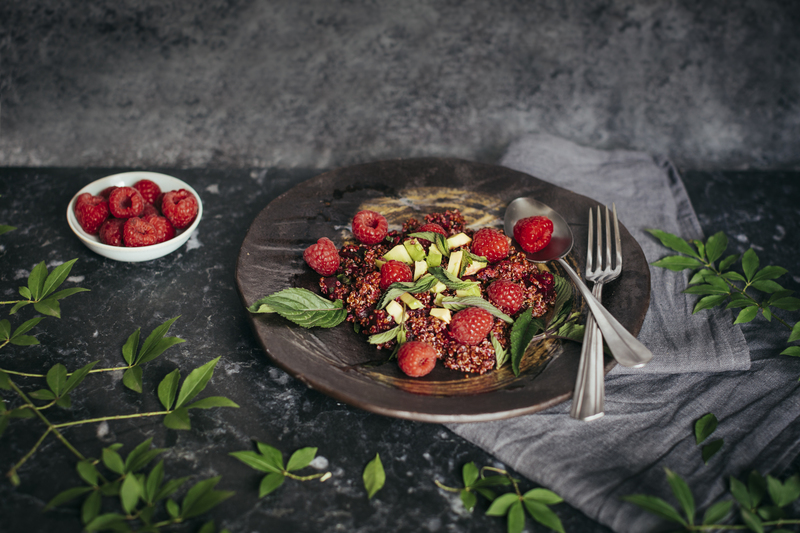 To serve, add the beets to the quinoa followed by the raspberry mash and plate it adding a garnish of fresh raspberries, avocado, mint and pistachios if using.